I don't read a lot of non fiction books, but it is something I want to delve further in to. Often, when I do pick up non fiction, those books are light in content and something specifically targeted to my interests. In the future, I do hope to expand beyond these realms and step out of that comfort zone, as I have started doing within my fiction picks, but for now I'm just trying to step up my intake of non fiction books. Today I'm going to be sharing a little on three recent non fiction reads. I'm very much someone who loves routine, probably enhanced when I had a child, but I've always been someone who thrives on routine, naturally when I learnt about this book I was keen to pick it up. Currey has curated an inspiring collection of writers, artists, musicians and more, sharing the daily rituals of those individuals taken from notes, books, essays and other correspondence compiled in to easy to read passages that are written as observations almost. Some of those featured include Jane Austen, Ernest Hemingway, Haruki Murakami, Agatha Christie, Nikola Tesla, Charles Dickens, Andy Warhol, Stephen King, and so many more - that's just a little sample, there are over 150 featured! There is a table of contents at the start of the book which is nice for if you want to skip straight to some of your favourites. Reading the ways in which such creatives went about their daily lives, and learning of the things that helped them produce the work that they did, is eye opening, motivating and very insightful. Eye opening may seem like an odd choice of word there, but I had no idea about the amount of substance abuse that took place during certain periods of time, with a number of those featured turning to alcohol, drugs and stimulants in general pretty frequently. Daily Rituals is the kind of book that you dip in and out of from time to time, perhaps a passage a day whilst eating your breakfast - make it a part of your own routine - but if you're a bit of a nosy one like myself, or perhaps you work from home and find setting your own structure something you struggle with, I'd recommend picking this up as it really does make you think about how you're spending your own time. If you're British, and not following Very British Problems on Twitter, then you're missing out. The observations shared are spot on and give you a little chuckle as you realise the many ways the latest tweet relates to your own life. For all intents and purposes, the Very British Problem book is just an extension of the Twitter account, but one of those light witty reads that are great for picking up now and again. The book itself is easily readable (I finished the entire book in less than a couple of hours) but one that is sure to put a smile on your face. Both accurate and amusing, Very British Problems would make a great gifting book. As readers, we all love books, therefore we all love stories and in turn the place we can buy stories - bookshops! The Bookshop Book is a collection of stories from bookshops around the world, so naturally, you'll love it! Alongside the stories of bookshops and booksellers, you'll also find some interesting little bookish facts inserted here and there, as well as interview snippets from some well known authors regarding their own book history. Some of you may have heard of Jen Campbell before; she is the author of some other wonderful book related content - Weird Things Customers Say In Bookshops and its follow on More Weird Things Customers Say In Bookshops which are both well worth checking out, as well as being a content creator on YouTube sharing some really wonderful book recommendations (so far she has yet to steer me wrong) and is also a poet on top of that. If I'd delved in to this book at any other time of year, I'm sure you'd be reading a long and lengthy love letter-esque post with me gushing about how well researched this book is, how passionate about books those featured are, how the stories shared are empowering, motivational, touching, joyful and basically every emotion ever, how I want to visit every single possible bookshop featured, and so much more that I don't even want to think about because I could just talk, and talk, and talk, but seen as it's nearing the end of the year and I'm wrapping up my reviews for 2015, I've had to condense to just a few passages. Really and truthfully, those weren't needed. All you need to know is this - if you love books, you need to read this! I'd love to read The Bookshop Book! Her first collection Weird Things Customers Say in Bookshops was great! And I actually think there are 2 collections available in the UK -- so funny! I'd highly recommend it Christine - I know your bookshelves are pretty much buckling (:-P) but they'd happily welcome The Bookshop Book. Okay, The Bookshop Book is definitely going on my to-read list now! I love Very British Problems on Twitter! I must see if it's available here. Weird Things Customers Say in Bookshops was great too, I need to check the new one out too. 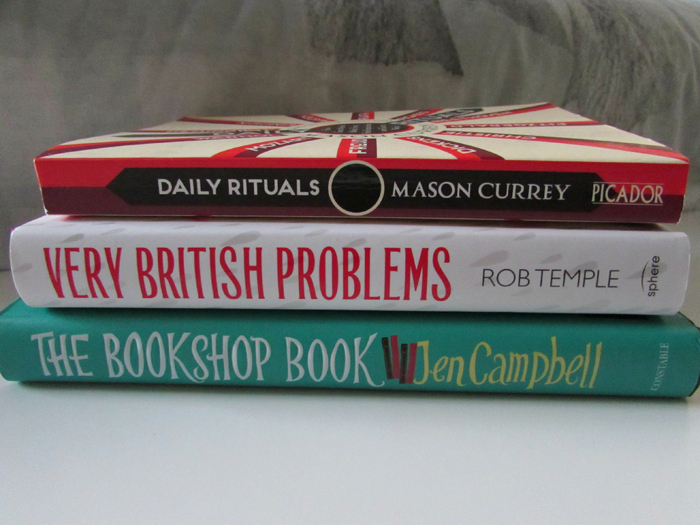 Both The Bookshop Book & Very British Problems would make good additions to a bookshelf - especially The Bookshop Book. I think that's one book I'll be recommending for quite some time! So I show them a video of myself getting paid over $500 for paid surveys.